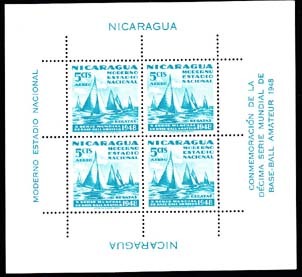 11182 SS NICARAGUA (1949) Regatta. S/S of 4. Scott No C300, Yvert No PA271. 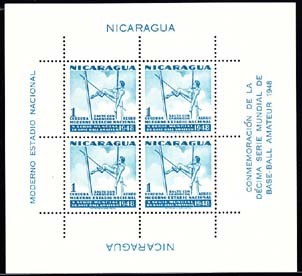 11296 SS NICARAGUA (1949) Pole vault. S/S of 4. Scott No 719, Yvert No 737. 11301 SS NICARAGUA (1949) Proposed stadium. S/S of 4. Scott No C299, Yvert No PA270. 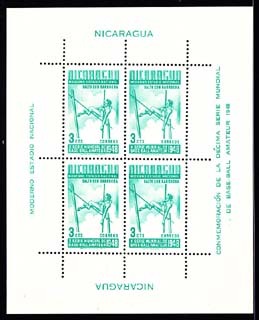 11303 SS NICARAGUA (1949) Pole vault. S/S of 4. Scott No C306, Yvert No PA277. 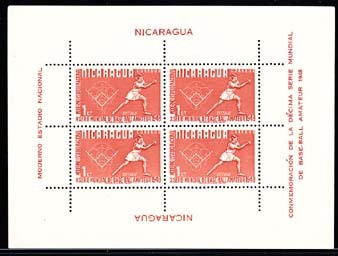 11340 SS NICARAGUA (1949) Softball. S/S of 4. Scott No 717, Yvert No 735. 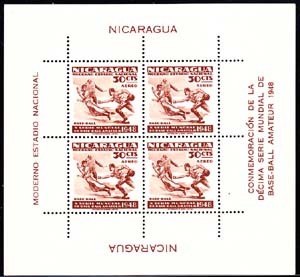 11341 SS NICARAGUA (1949) Baseball. S/S of 4. Scott No 723, Yvert No 741. 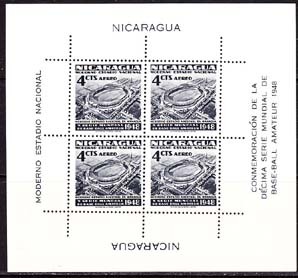 11342 SS NICARAGUA (1949) Baseball. S/S of 4. Scott No C303, Yvert No PA274. 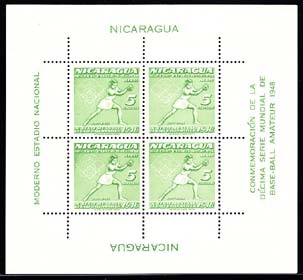 11343 SS NICARAGUA (1949) Softball. S/S of 4. Scott No C308, Yvert No PA279. 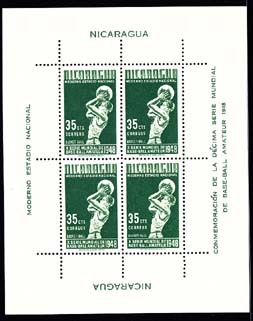 11349 SS NICARAGUA (1949) Basketball. S/S of 4. Scott No 724, Yvert No 742. 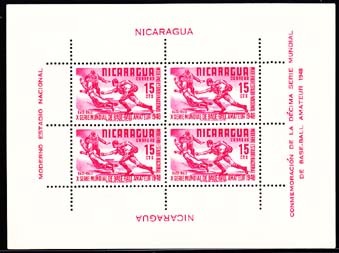 11350 SS NICARAGUA (1949) Basketball. S/S of 4. Scott No C301, Yvert No PA272. 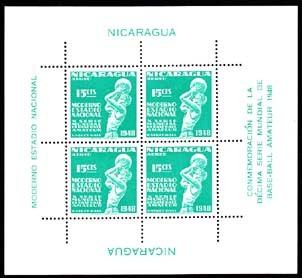 11519 SS NICARAGUA (1949) Diving. S/S of 4. Scott No C305, Yvert No PA276. 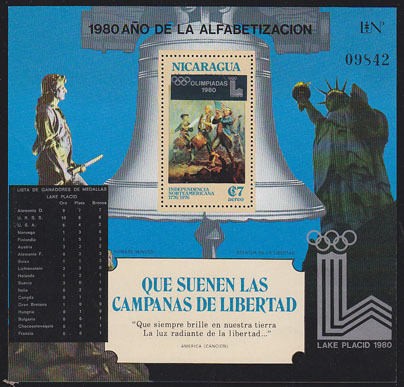 11468 SS NICARAGUA (1980) Liberty bell*. List of winners (Lake Placid Olympics)*. Status of Liberty*. 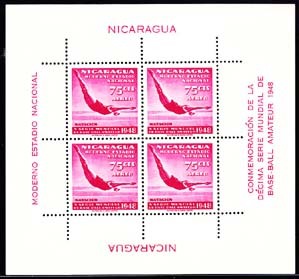 Souvenir sheet. Michel Block 119.